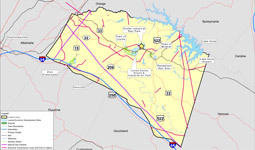 If you need a custom map for a project or site selection assistance, please contact Andy Wade, Economic Development Director, at (540) 967-4581 or email at econdev@yeslouisa.org. 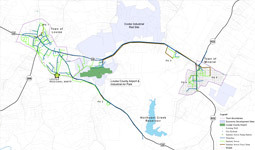 Transportation map of the County, including interstates and major highways, airports, rail, towns, sites and more. 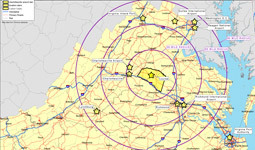 Louisa County's proximity to cities/towns and major transportation/logistics features. Water and sanitation map for the Northeast Creek Reservoir showing the Town of Louisa, the Town of Mineral and several economic development sites. 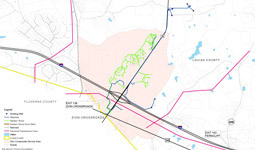 Water, sanitation and electrical utility map for the Zion Crossroads/Interstate 64 Exit 136 area. 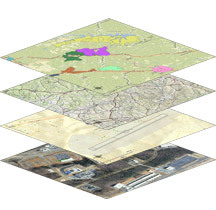 Get answers to your critical questions about any site in the County with our GIS system, including development zones, satellite imagery, property boundaries, topography, zoning, schools, public safety, utilities and much more.